‘Spotlight’ shines this week on a remarkable Sri Lankan woman whose qualitative contribution to the realm of music has been noteworthy. Although devoted in principle to films, film personalities and film-related matters, this column will deviate in practice to focus on the internationally-celebrated composer – pianist Dr. Tanya Ekanayaka, whose second solo album was released worldwide yesterday, 14 September, by Naxos Records. Naxos Records is a member of the Naxos music group founded in 1987 by Klaus Heymann, a German-born entrepreneur based in Hong Kong. Naxos is the world’s leading classical music label as measured by the number of new recordings it releases and the depth and breadth of its catalogue. Dr. Ekanayaka has been contracted with Naxos since August 2014. Tanya Ekanayaka is currently based in Britain. She is employed at the Department of Music, Edinburgh College of Art in the University of Edinburgh as a lecturer, tutor and pianoforte performance teacher. Classically trained and with a background in popular and South Asian music, Tanya Ekanayaka is also a record producer, improviser and musicologist in addition to being a highly qualified linguist. Tanya began studying the piano when she was just five years old. She made her debut public recital appearance at the age of twelve, performed her first concerto (Mozart’s Piano Concerto K.488), at sixteen, with the SOSL (Symphony Orchestra of Sri Lanka), and emerged joint winner and youngest competitor of the SOSL biennial concerto competition. Since then she has performed in renowned international concert venues in Asia, Europe and the United States. Consistent with her inter-disciplinary background, she holds a Bachelor of Arts (BA) Honours degree in English Literature and Linguistics from the University of Peradeniya, a Master of Science (MSc) degree in Linguistics and English Language from the University of Edinburgh in Scotland, and a Doctorate for her inter-disciplinary research in Linguistics and Musicology also from Edinburgh University. Tanya Ekanayaka is also a Fellow of the Trinity College of Music London (FTCL), and a Licentiate of both the Associated Board of The Royal Schools of Music (LRSM), and the Guildhall School of Music and Drama (LGSMD) UK. The Guildhall school awarded her its Professional Performer’s Diploma (PPD) in 1999. I first interacted with Tanya in August 2012 when she went to Jaffna to conduct a musical performance and workshop titled ‘A Moment of Healing for Us All Through Music’. The workshop was jointly organised by two leading girls schools in Jaffna, namely the Chundikuli Girls College (CGC) and Uduvil Girls College (UGC) in collaboration with the SJC87 Initiative based in Australia. When invited to conduct a workshop for northern students, Tanya readily agreed to do so. She suggested that it be a workshop of a healing nature using music as a therapeutic tool. Over 50 people comprising 40 students and a dozen teachers participated. The power, emotional impact and utilitarian value of music has been felt and realised by people from all walks of life throughout the ages. It is a sublime form of expression. Apart from being valued as a mode of communication, music is also being appreciated for its therapeutic effect. It is being recognised as a curative and restorative instrument. It is a medium of healing on individual, group, personal and social levels. It was in this context that the music workshop was conducted by Dr. Tanya Ekanayaka in Jaffna. Last week I was in touch with Tanya by telephone and e-mail to discuss and talk about the release of her second solo album. The album titled ‘Twelve Piano Prisms’ comprises 12 new works for solo piano. It is 55 minutes in duration. Tanya Ekanayaka herself performs the works/prisms in the album recorded by Roderick Buchanan-Dunlop and produced by Tanya for Naxos. The 12 piano prisms correspond to the 12 primary notes of the keyboard, and combine Sri Lankan melodies with music from other countries in a deeply personal representation of diverse cultures. Their style is inspired not only by a rich heritage of Western classical and indigenous world music, but also by pop, rock and film music. Although Tanya trained as a pianist, it must be noted that her compositional skills are the result of a purely intuitive and natural development. Explaining and elaborating on her compositions which she describes as “transcreations” Tania Ekanayaka said: “The 12 works/prisms on this album evolved between 2016 and 2017. Collectively, they explore two concepts. The first is an extension of the concept introduced on my debut album, ‘Reinventions: Rhapsodies for Piano,’ where each work contains adaptations of indigenous Sri Lankan folk and traditional melodies. The album contains, among other melodies, adaptations of 10 of the 18 Sri Lankan vannams. Vannams are an ancient set of dances imbued with a rich percussive character dating back to the 16th and 17th centuries, which developed in the courts of kings. Vannams are secular in character and most depict specific animal movements. The word ‘vannam’ is descended from the Sanskrit ‘varnam’, which translates as ‘descriptive praise’. “This album contains adaptations of the remaining eight vannams, as well as transcreations of several other Sri Lankan folk and indigenous melodies. Some of the works also contain adaptions of traditional and ancient melodies of other countries in which I have performed or with which I have been associated musically. In some instances, I have combined adaptations of a section of a Sri Lankan melody with adaptations of sections of a melody belonging to another country to form a new blend. The effort has been to create an organic union rooted in the present ‘moment’, and yet formed through the adaptation and conflation of melodies stemming from diverse socio-cultural and historical spheres. The countries represented in addition to Sri Lanka include Armenia, Japan, China, the United Kingdom and the United States. The adapted melodies are simply a deeply personal re-presentation of, and tribute to, their original forms and their attendant cultures and people. “The second dimension of this album relates to the relationship between the works. They are completely organic and independent. However, it is equally possible to link any or all of the 12 works in any combination with connecting improvisatory motifs to form new ones. This owes to certain features which are shared between the works. Not only do they each contain indigenous Sri Lankan melodies but certain motifs and techniques are at times referenced across them. Some of the Sri Lankan vannams also share similar melodic patterns which further enhance the connectivity. E Flat – July 2016/17: The motif with which this work commences is built around the notes E flat, C sharp/D flat, G, D, F sharp and F, representing the dominant tonal centres of the seven works comprising my debut album Reinventions: Rhapsodies for Piano, while its concluding sequence echoes the conclusion of the album’s opening work Adahas: Of Wings Of Roots. The central part of this work contains an adaptation of a traditional Sri Lankan folk song. It evolved in the months of July of 2016 and 2017. B Flat – Armenia to a Pearl: The transcreations of a traditional Armenian melody and a well-known song celebrating Sri Lanka titled Lanka Lanka by the Sri Lankan musician Sunil Shantha (1915–1981), are combined in this work. It developed in February 2017 and was premiered at the Cafesjian Center for the Arts in Armenia in May 2017. C – Emerald Lapwing Karpet: This work pays homage to the Phrygian dominant scale associated with Armenian music and also includes the adaptation and blend of two Sri Lankan vannams, namely the Vairodi (‘Emerald’) and Kirala (‘Lapwing’) vannams. The inclusion of the Vairodi vannam in this work is partially connected to the fact that the Emerald represents the month of May during which time this work was premiered at the Cafesjian Center for the Arts in Armenia in 2017. It evolved in March 2017. D Flat – Intuition, Auld Lang Syne & an Asian Sacred: Representations of two distinctly different melodies, namely, the iconic 19th-century Scottish folk song Auld Lang Syne, and the Sri Lankan Surapathi vannam feature in this work. It evolved in August 2017. G – With Paaru Kavi: A transcreation of the famous Sri Lankan chant or kaviya, the paaru kaviya representing the vocation and life of the traditional Sri Lankan fishing community, floats among other motifs in this work. It developed in the fall of 2016 and had its world premiere at St Martin-in-the-Fields in London in January 2017. F – Renewal & Goyam Kapuma: Evolved in the autumn of 2016, this work contains an adaptation of the traditional Sri Lankan chant Goyam Kapuma associated with harvesting rice, the dietary staple of Sri Lankans. It had its world premiere performance in London in January 2017 at St Martin-in-the-Fields. E – Arrow-and: The Eeradi and Uranga vannams representing the arrow and reptile respectively form the core of this work which developed in August 2017. The gentle lyrical tone of the work is intended to reflect the illusive tenderness of the often misunderstood and maligned reptile. A – Zuni Sea: Beginning with two melodic formations which are echoed subsequently, A – Zuni Sea combines adaptations of the ancient sunset song of the famed Native American Zuni Indian tribe and historic Sri Lankan Gahaka vannam. The latter represents the conch shell. It evolved in June 2017. A Flat Scintilla: Komitas Unto Childhood: In this work, an adaptation of Chinar es by the Armenian composer and musicologist Soghomon Soghomonian known as Komitas (1869–1935), pairs with an adaptation of a famous Sri Lankan song about childhood titled Ma Bala Kale by the Sri Lankan musician, C.T. Fernando (1921–1977). It was formed in February 2017 and was premiered at the Cafesjian Center for the Arts in Armenia in May 2017. B – Of Vannam & Zhuang Tai Qiu Si: Combining representations of the Sri Lankan Asadrusha vannam and the Chinese song Zhuang Tai Qiu Si, this work, which developed in September 2017, also contains representations of the Pentatonic scale often associated with Chinese music. F Sharp – Kitty & Wana Bambaru: This work involves the interplay between a lyrical episode dedicated to a homeless cat who wandered into and has since become domiciled in my home, and an adaptation of the famed Sri Lankan popular song Wana Bambaru (which translates as ‘Jungle Bees’) by the Sri Lankan musician, C.T. Fernando. It concludes with a brief tribute to the famed Sri Lankan song Handa-pane by the Sri Lankan musician, Sunil Shantha. The central part of this work contains a brisk scale like pattern in the left hand intended to represent the flight and buzz of bees in their natural habitat, and this subsequently blends with an adaptation of the Wana Bambaru melody. Formed in the autumn of 2016, this work received its world premiere performance at St Martin-in-the-Fields, London in January 2017. D – Hana Hare: This work contains a reinvention of the famous Japanese song Hana by Rentarō Taki (1879–1903) and an adaptation of the Sri Lankan Musaladi vannam which translates as ‘Praise of the Hare’. It evolved in June 2017. As stated earlier, Tanya’s second solo album is in a sense a continuation of her first solo album as far as her exploration of the ‘Vannams’ are concerned. It extends the concept introduced by Tanya in her debut album while also exploring a new concept. 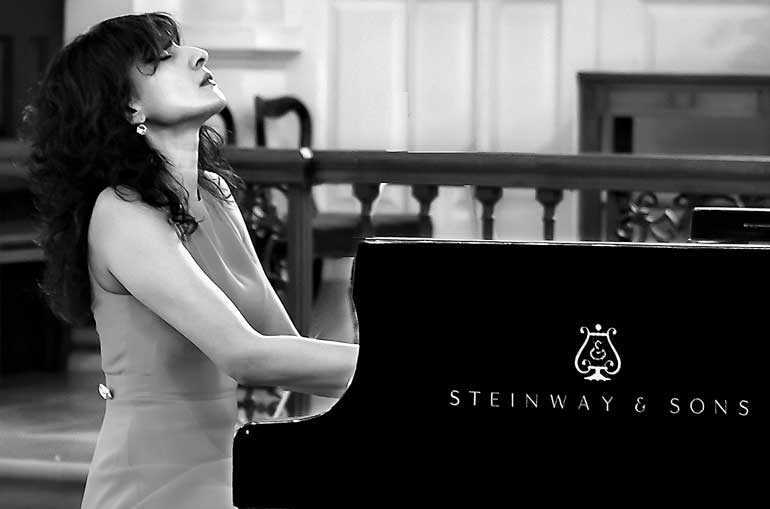 Her debut album of compositions for solo piano composed, performed and produced by her, titled ‘Reinventions: Rhapsodies for Piano’ was released worldwide by Naxos in 2015.This album introduced a new musical genre developed by Tanya Ekanayaka and also represented the first ever album of compositions entirely by a Sri Lankan composer to be launched globally by a major record label. Among Tanya’s musical gems (not counting the two solo albums) the jewel in the crown could very well be ‘Adahas: of Wings of Roots’. This was her own composition. ‘Adahas’ means thoughts in Sinhala. While Adahas relates to thoughts the term, ‘wings’ is a metaphor for re-invention and ‘roots’ represents the sources of the compositions. The composition integrates some elements of Bach, Beethoven and Ravel in synergy with certain sounds of traditional Sri Lankan music. What is noteworthy is that ‘Adahas: of wings of roots’ was created specifically for a path-breaking recital London recital in about 15 minutes. This is how it happened. In July 2010, Tanya became the first Sri Lankan pianist to perform in the ‘Pianists of the World’ series at London’s St Martin-in-the-Fields. The audience at this concert was reportedly among the largest audiences recorded at lunchtime concerts at St Martin-in-the-Fields. Tanya’s programme concluded with the world première of her composition ‘Adahas: of Wings of Roots’ which was the first Sri Lankan composition to be performed at this venue. This composition created in about fifteen minutes is an example of the distinguishing feature of Tanya’s recitals. The composition received further recognition and kudos in 2017 when Naxos released ‘Grand Piano – The Key Collection; 3 Centuries of Rare Keyboard Gems’. Tanya Ekanayaka’s ‘Adahas: of Wings of Roots’ was also included in that collection. Her’s was the only composition by a Sri Lankan to be included so. Tanya Ekanayaka’s compositions are regarded as representing new and exciting musical genres. Tanya’s compositions may be seen as re-presenting her indigenous culture while also conflating diverse musical genres and eras within a contemporary and organic entity. Tanya also regards her compositions as deeply autobiographical ‘moments’. She attributes her compositional style to her multilingual and multicultural backgrounds as well as to being ambidextrous and having partial colour synaesthesia. She grew up in the city of Kandy where she was exposed to a broad spectrum of music from a very early age. Devoting endless hours to evolving original music was how she attempted to comprehend and express the kaleidoscopic convergence of these various cultural and linguistic facets which seemed to define her. I have not had the privilege of seeing a live piano recital by Tanya Ekanayaka so far but I have had the pleasure of seeing her perform and listen to her music through video, audio and YouTube. What I saw and heard gave me great satisfaction and joy. 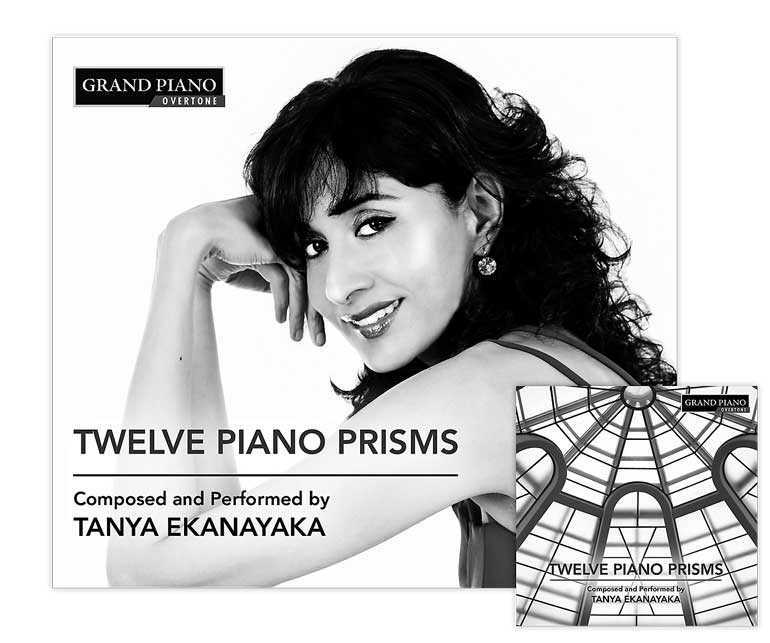 Tanya Ekanayaka’s recitals refresh my senses, soothe my mind and at times nourish my soul and I am delighted that her second solo album ‘Twelve Piano Prisms’ has now been released.